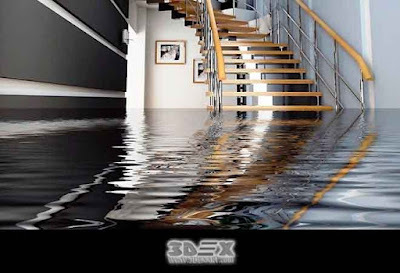 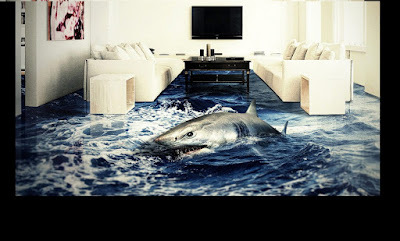 You also may like: 3D flooring prices and 3D epoxy flooring full guide. 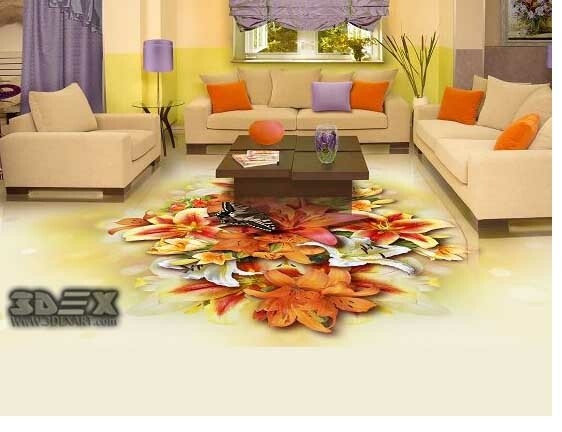 The living room is the place where most people gather, the place of meetings with relatives and friends, and hence the use of a strong accent, a key idea, is acceptable here. 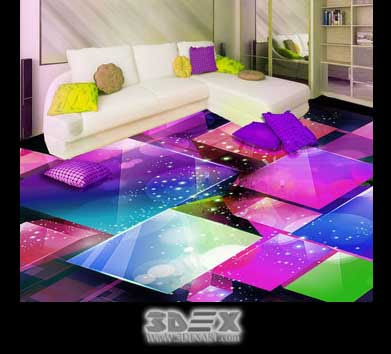 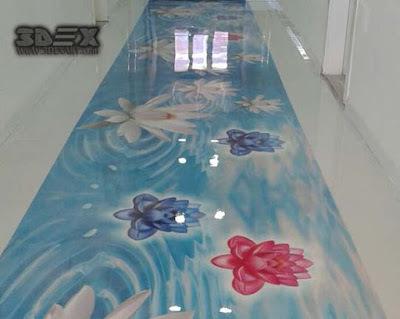 As such an accent you can make a 3D epoxy flooring design with geometric decorations, made in saturated colors. 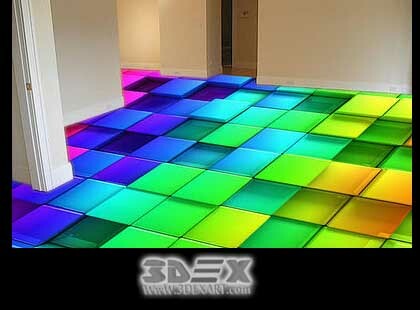 Lines can be smooth or sharp, and geometric objects are volumetric or scattered around the perimeter. 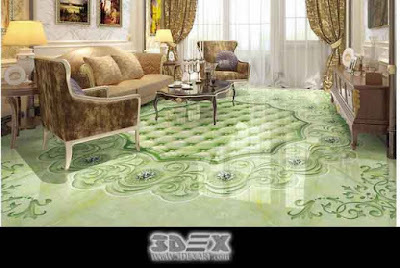 Floral 3D flooring designs with large buds of flowers, grass, landscapes of tropical forests are a very popular option. 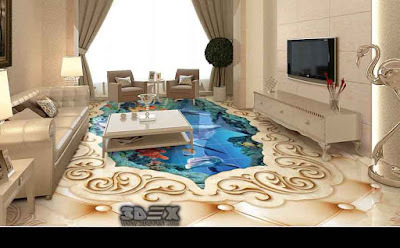 Compositions of patterns, allegedly traced by the artist's hand, are also found on the 3D epoxy floors in the living rooms. 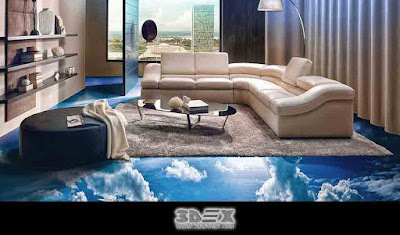 They give the interior refinement and luxury. As you can see in the images of 3D flooring design in the living room, in most cases, set the mood of the entire room, rather than complement the interior. 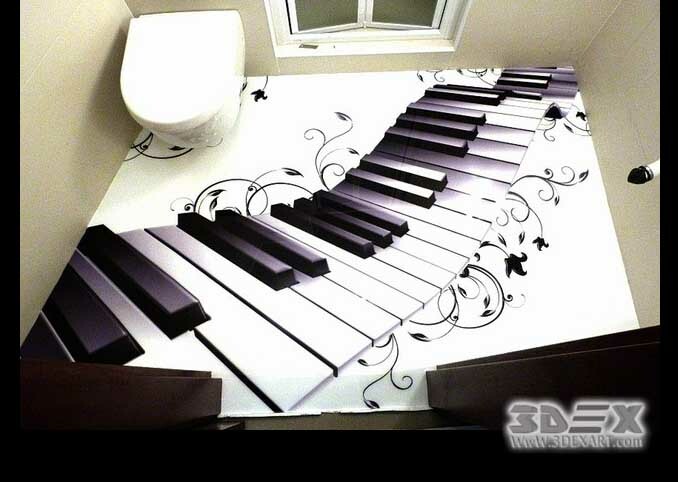 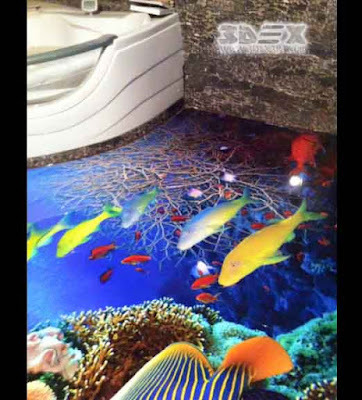 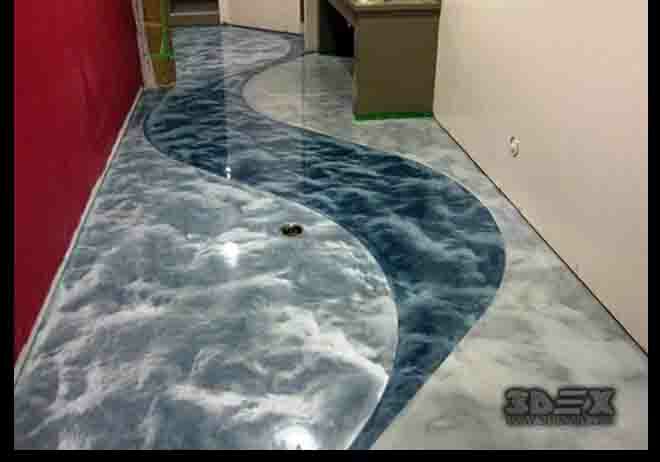 3D epoxy flooring designs in the kitchen are unlimited. Here, again, floral motifs, geometric ornaments predominate, urban themes with high-tech elements (city night lights, megalopolis landscapes) are suitable for kitchens. Ideally, if the kitchen backsplash and the floors are made in the same style and complement each other. 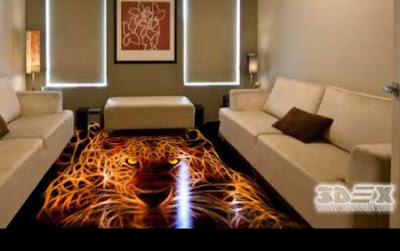 The similarity of subjects in the kitchen and in the living room is because these two rooms can perform the same functions, and often the kitchen is also the place where the whole family gathers. 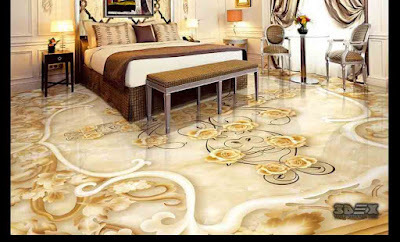 A bedroom is a place for rest and relaxation. 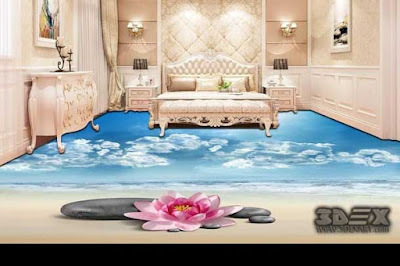 It is more acceptable to use calm textures (sand, grass, flowers, stones, wood, clouds), unobtrusive patterns and ornaments. As can be seen from the images, 3D flooring designs in the bedroom are more often a complement to the entire interior, rather than an accent, although there are exceptions. Bathroom - one of the most favorite sites for designers to implement creative ideas, because there are almost no restrictions on color, pattern, contrast, and themes. The most popular topic is water in all its manifestations. 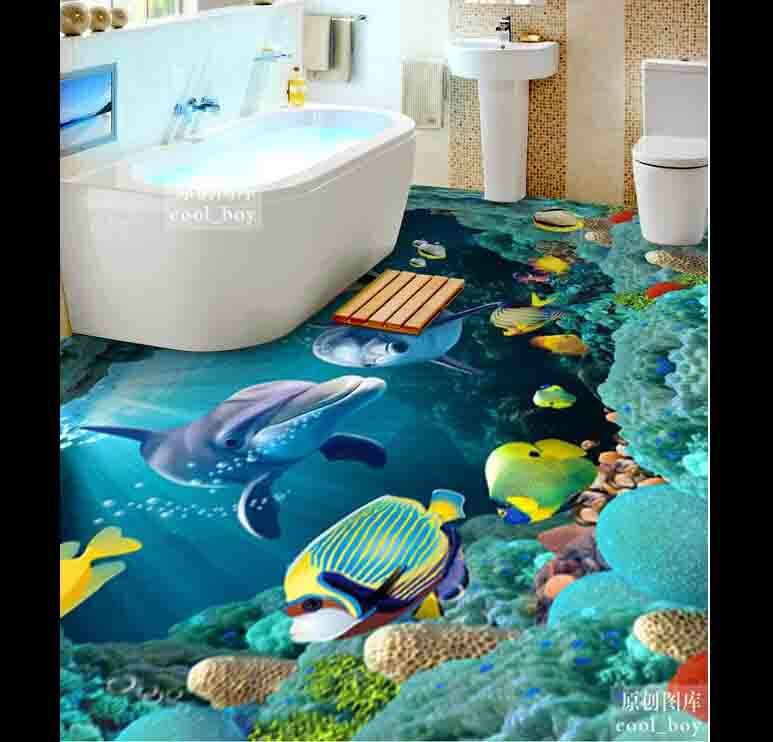 This is the underwater world with its inhabitants (voluminous images of dolphins, fish, sea stars), and the ocean, and the coast of the island with waves pounding against the sand, and waterfalls. 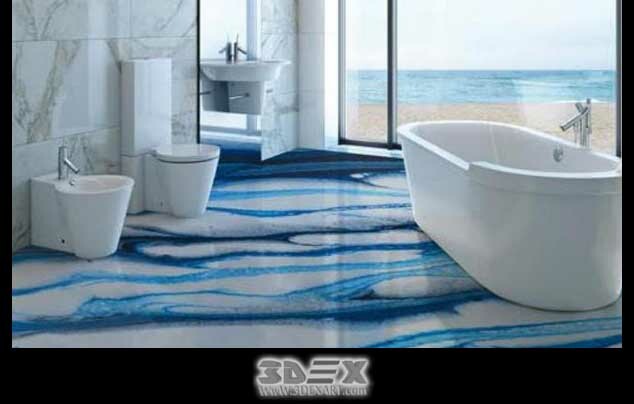 Often the 3D bathroom floor theme of water is complemented by different textures - sand, pebbles, shells, plants. 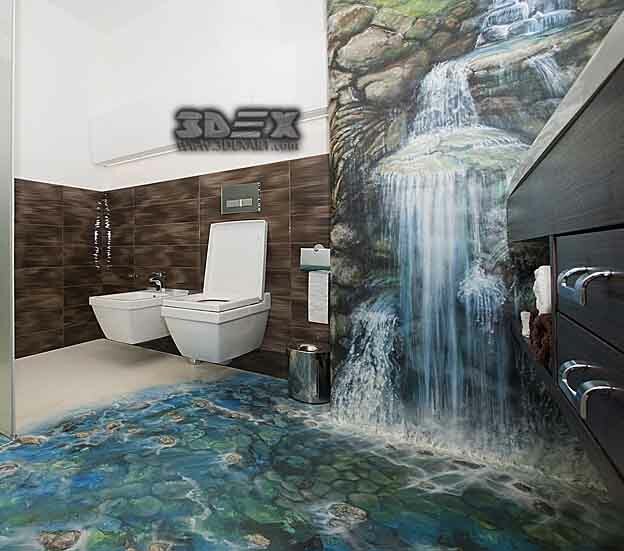 No less popular is the space theme 3D bathroom flooring design, executed in a single style with the walls in such a way that a feeling of weightlessness is created. 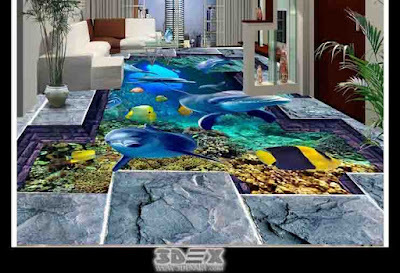 3D flooring images of flowers and exotic animals are often used. 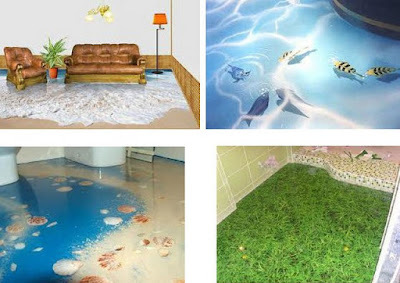 First of all, remove images whose low resolution and quality. 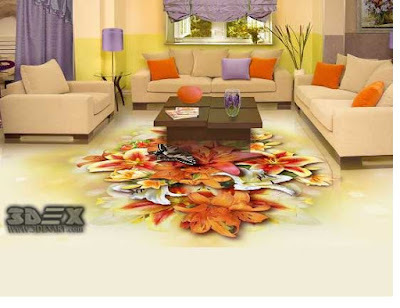 Choose only high-resolution images. 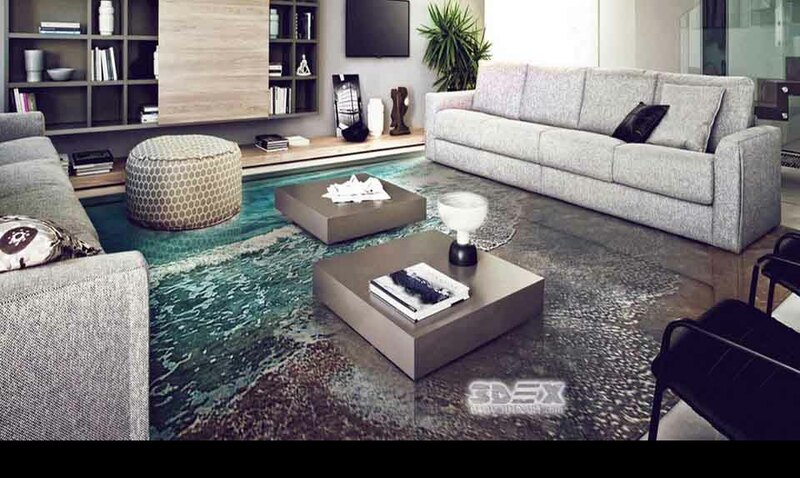 Print out the picture and proceed to pour the floors. 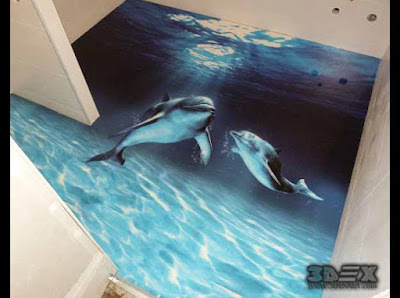 Three-dimensional drawing can be performed not only on 3D epoxy floors but also on walls using the same technology. When the floors and the wall surface complement each other, the image becomes really bulky and realistic. This option is ideal for bathrooms or walls not loaded with furniture. 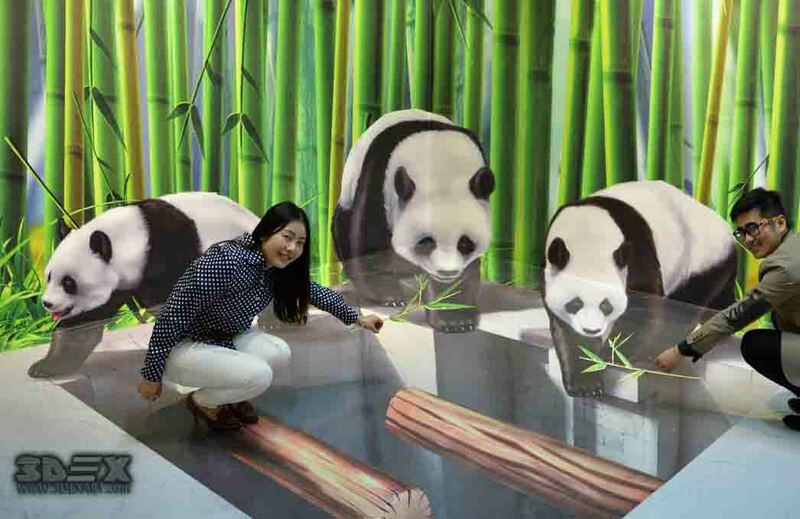 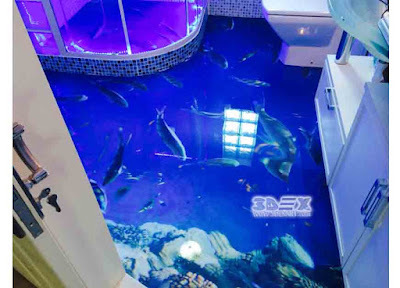 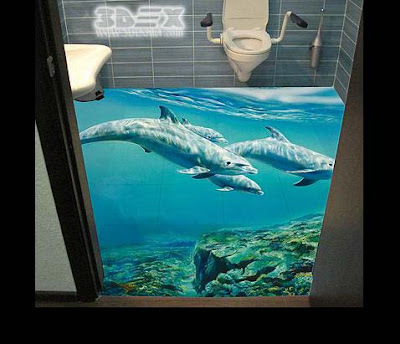 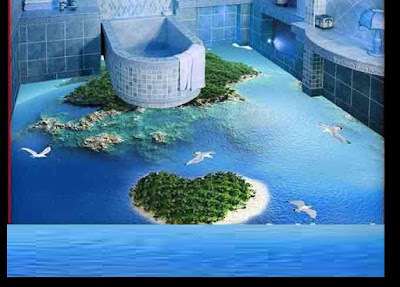 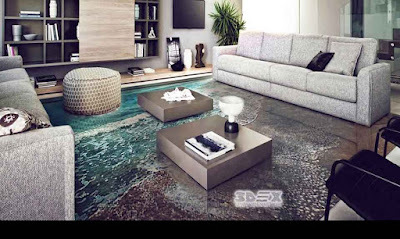 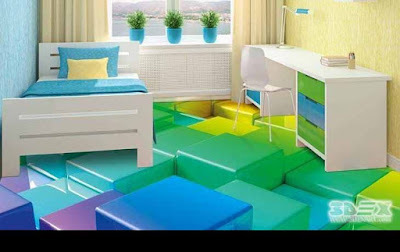 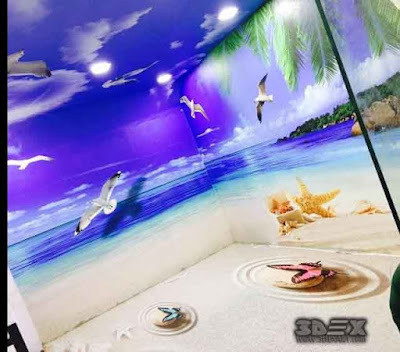 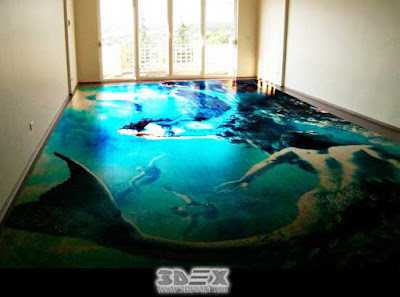 Involve at least one wall together with the 3D epoxy floor and the effect will shake your imagination. Modern 3D epoxy flooring is the best solution, as it has a number of advantages. 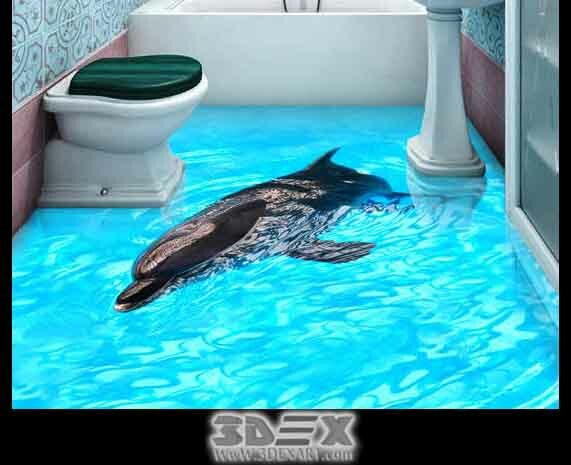 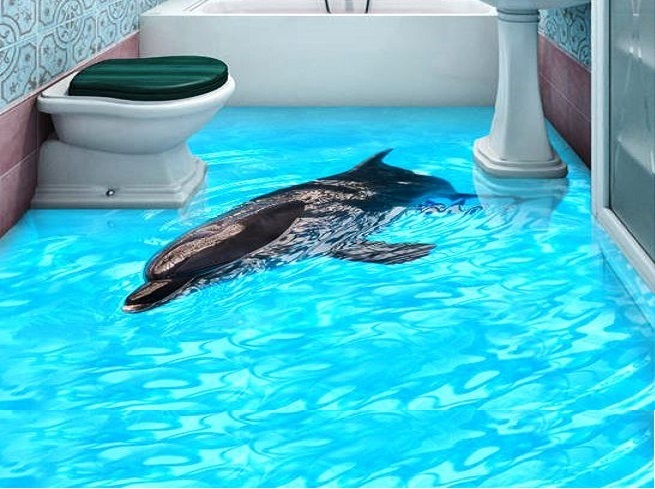 The 3D epoxy floor design is capable of plausibly simulating a wide variety of surfaces. 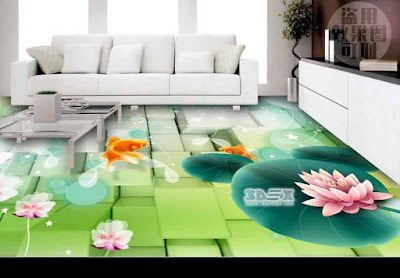 This is achieved through the use of prints with a printed graphic two-dimensional drawing, which has the high accuracy of printing. 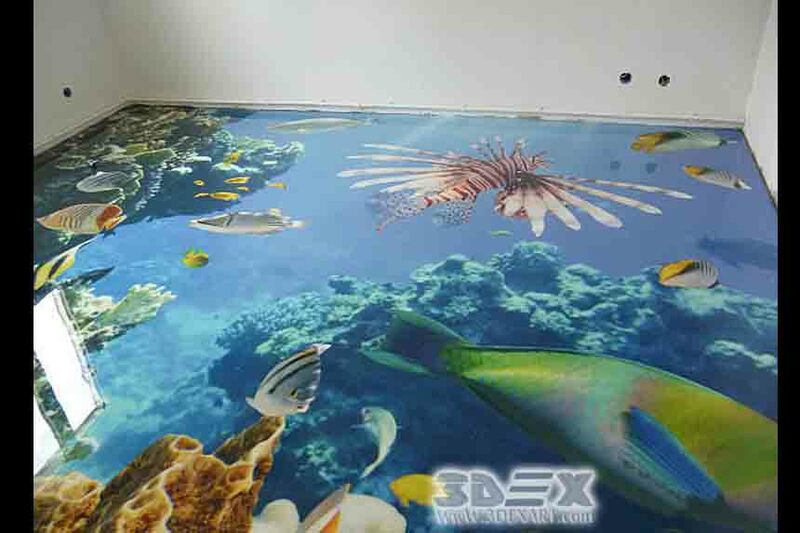 The final polymeric transparent layer creates an additional illusion of image depth. Depending on the level of the thickness of the top coating, the floors can be thin-layered and highly filled. The latter, as a rule, are used in places of large concentrations of people. 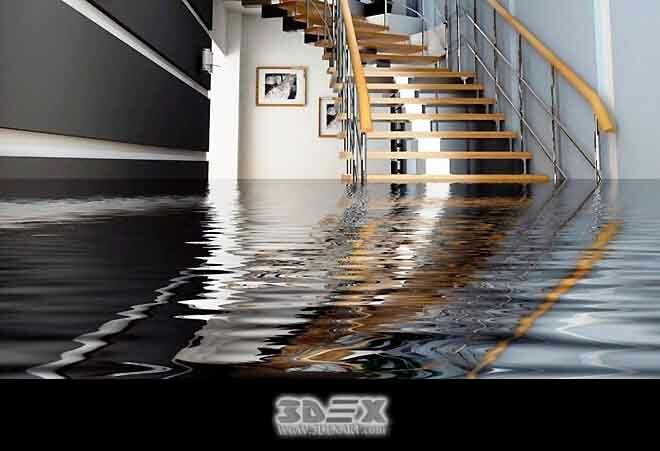 Due to their high strength and resistance to abrasion. 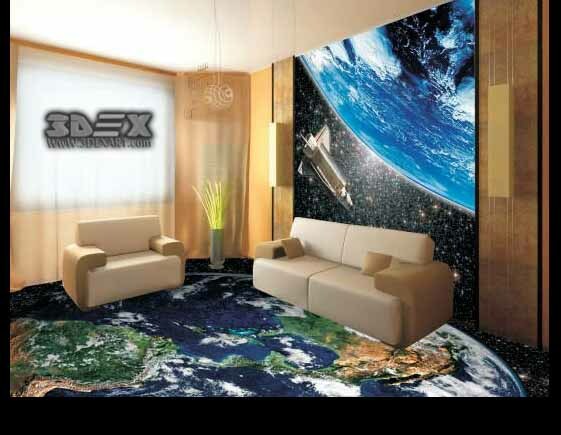 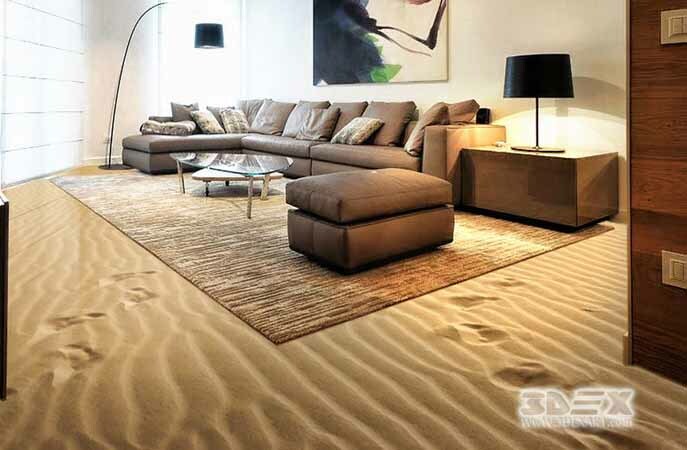 To a greater extent, the 3D flooring prices depend on the costly printing of the image. 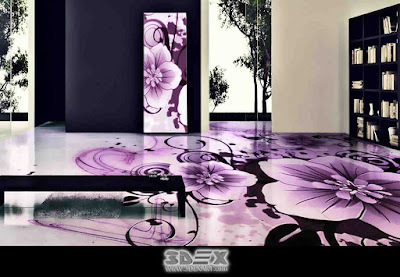 It is applied to a special fabric or film, while high-quality printing is a prerequisite. 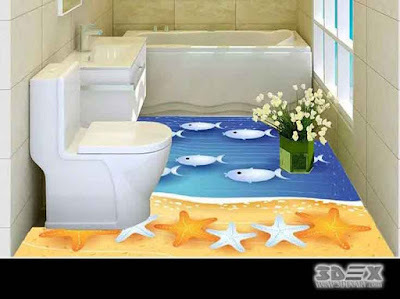 To achieve maximum effect of the 3D flooring image, a large enough space is needed, although this is also applicable in a small-sized bathroom. In addition, to ensure that the 3D epoxy flooring in the bathroom is homogeneous, you will have to make the base perfectly flat.